Cultivate the Creative Economy – Include it in All Economic Development and Workforce Development Programs. $4.97 Billion in wages, 88,761 in total employment and 10,706 in total establishments according to Creative Many MI’s 2016 Creative Industries Report. Engaging the creative industries as a central part of the state’s efforts to diversify and build a thriving 21st century economy is smart for Michigan. Insist that arts and creative professionals are engaged in leading and shaping arts and creative industries economic development. 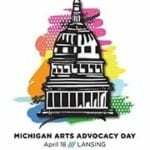 Restore State Arts Funding – currently $12.5 million (was $28.8 million in 2001) – join other Michigan Senate and House leaders to invest in the Michigan Council for Arts and Cultural Affairs (MCACA) at this level. People, businesses, schools and communities throughout the state benefit from the ripple effect of this investment. Insist that arts and creative professionals and educators are engaged in leading and shaping MCACA. Insist that Arts and Creative Education is Available to Every Child in Every Classroom Michigan. Study after study shows that students’ grade points increase in all subjects, they stay in school longer, SAT scores rise and they develop the skills desired by 21st century employers when the arts are an integral part of their education. Insist that arts and creative professionals and educators are engaged in leading and shaping arts and creative education. Prioritize Arts and Creativity in Tourism Investment and Marketing – The arts and creative industries drive Michigan tourism – its third largest industry. In 2016, Michigan’s cultural activities generated more than $1.3 billion in direct tourism spending by visitors –12.6% of total spending for all Michigan leisure. That’s Pure Michigan. Insist that arts and creative professionals and educators are engaged in leading and shaping arts and creative education.